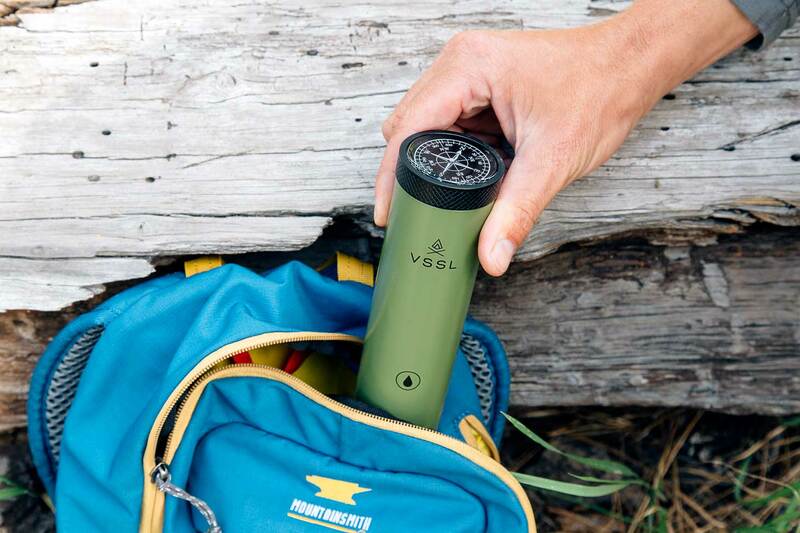 The VSSL Flask is a utility flashlight that holds 10 oz of (adult) beverage, two collapsible stainless steel shot glasses, and a bottle opener. Plus it comes with a built-in compass, so after you’ve had a few you can still find your way back to your tent. This not a sponsored post, however, we did receive this piece of gear for free for the purpose of this review. All thoughts and opinions are entirely our own. 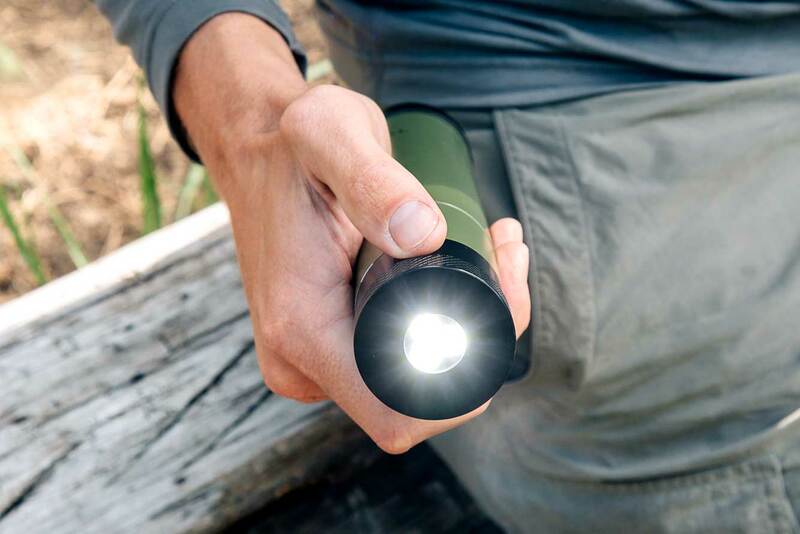 While other reviews have excitedly exclaimed “Bet your flashlight can’t do this…”, we’d like to respectfully point out the obvious: Nobody carries a flashlight this large anymore. The whole baseball bat sized flashlight craze spawned by Maglight in the late 90’s has come and gone. The D cell battery is dead. The whole world has gone LED now – and so has VSSL. Still, you can never have too many light sources when camping, so the fact this camping flask has a light on top is an added bonus for us. One improvement that VSSL has made worth noting is the actual flashlight button itself. Many lights have the tendency to accidentally turn on when jostled inside a backpack. When finally discovered, the result is usually a dead battery, a lot of swearing, and an unshakable feeling of betrayal. VSSL’s light prevents this by requiring a prolonged depression of the button to activate it. It might take a second longer to turn it on, but it could save you the entire life of the battery. 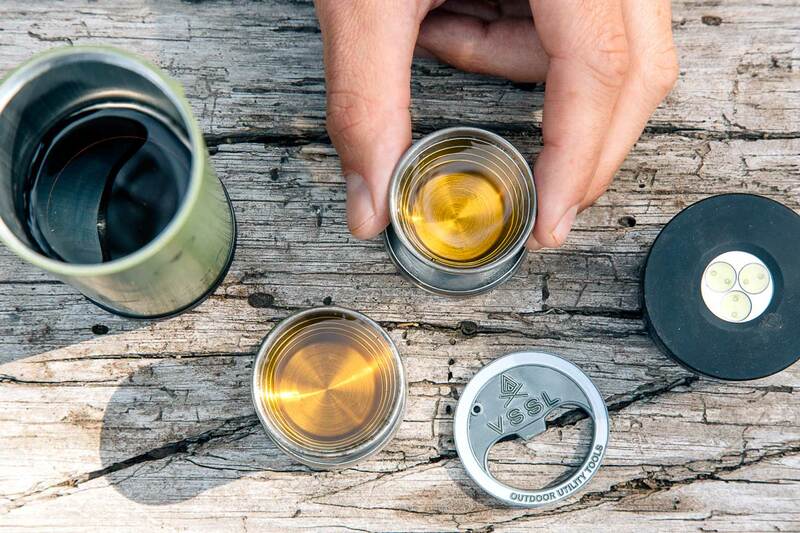 In terms of the collapsible stainless steel shot glasses, we’re pretty torn. On one hand, they’re kind of gimmicky – especially for those of us who have put our shot slinging days behind us. They also pose a risk: put them down too hard without finishing and the wall will collapsible around your drink. So either use a light touch or knock it back hard. (We’ve found that it helps to twist them a bit once telescoped to ensure the walls don’t fall down.) All that being said, they do have certain old man coolness to them. As in, they’re something our fathers would really get a kick out of. The good thing is that if you don’t find them useful, you can take them out and use that compartment 1) as a really big shot glass 2) to store a mixer like vermouth for a backcountry martini 3) just add more booze (the obvious choice). Overall we really like the classy design and solid construction of the VSSL Flask, but what we were most impressed by was the glass (infused) lined compartment for your liquor. Using a patented process called atomic-layer deposition, they’re able to bond glass on a molecular level to the interior surface. This lining is so thin and flexible that it can never be removed or broken. VSSL has to ship their Flasks to a special facility in California for this process, where they specialize in the storage of pharmaceuticals with zero-tolerance for leaching. Which, as one might imagine, is fairly pricey. But it shows VSSL’s commitment to keeping the important things in life (our alcohol) pure. Important note: While the VSSL flask is technically speaking pretty rad, it’s not insulated. So the temperature outside is going to be the temperature of the liquor on the inside. So if you’re going camping in Death Valley, maybe a White Russian isn’t the best drink choice. Love clever gear that you can show off to your campmates? Want to order a round of shots for everyone around the campfire? Summiting a mountain and want to make snow-garitas for your hiking partner? Would you like to invite a special somebody back over to your place for a nightcap, but need a flashlight to figure out which tent is yours? Then the VSSL Flask might be for you. 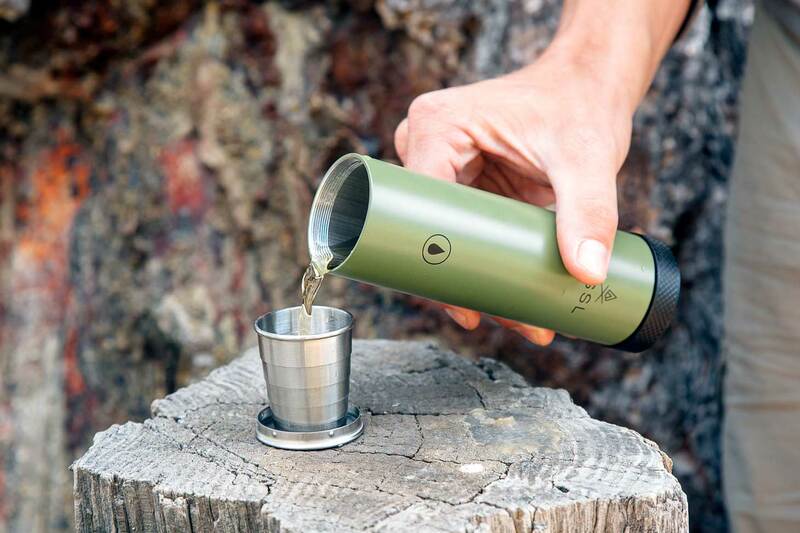 You can check out the Flask here as well as the full line of VSSL aluminum cylinders here. Wow! This is very handy! I wonder if roadeavour has this. Great review! Love this new section for gear reviews! Pretty cool product. Even though it’s a little bulky, it does come in handy with the shot glasses and bottle opener.